We've been here before: In 1991, Upper Deck was still a new brand, full of fresh ideas and energy. That was, until this card got produced. 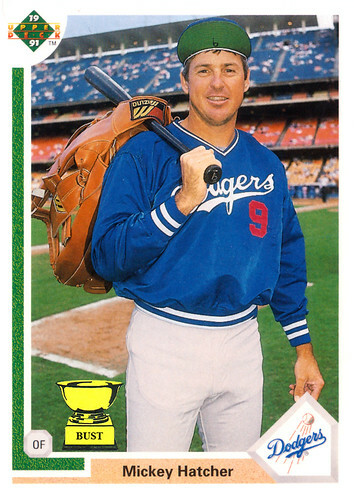 Oh, gee, Mickey Hatcher with a giant glove. How original! Why not go all out and get Glenn Hubbard to pose with a python, ask Jay Johnstone to put on his umbrella hat, and get Jose Canseco to take his shirt off? Yep, this was the moment Upper Deck moved to the cheap seats. however, the quality of their cards was already Center Field Bleachers.